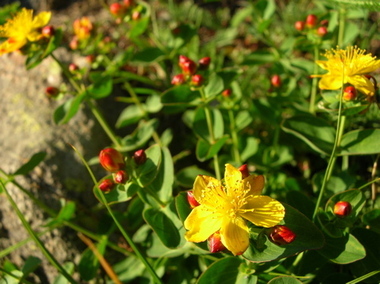 My latest favorite wild-flower, Western St. John’s Wort. 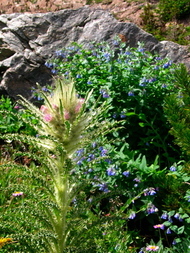 This patch grows amongst the rocks by Pine Creek Lake, at about 9,300 feet elevation. I have sworn to learn more about my camera and editing programs after this trip; the pictures are just too far from what inspires me to take them. It’s a stiff five-mile hike up, both further and steeper than Lava Lake, far enough to discourage most complete idiots, the sort who break bottles for a laugh. Even so it’s a popular spot, and I picked up a fair amount of trash. I’m a dedicated “leave no trace” camper and have no problem packing out my own toilet paper, but it does irk me to carry out—or at least to pick up—someone else’s. 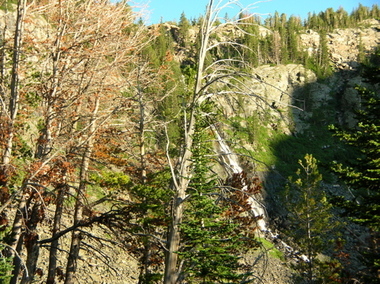 While steep and long, the trail is also variously, but unvaryingly, beautiful. There are pine woods, meadows, dry stony slopes, and boggy areas, each with its own profusion of flowers and vegetation.Aside from those I actually include here, there are the many I saw but didn’t photograph, because my camera battery gave out on me. Before it did, though, I snapped the heartleaf arnica , buttercups, and violets in the upper picture, and the Everts thistle and mountain bluebells in the lower one. 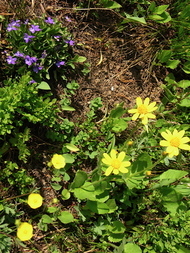 Pleated gentian, lupine, asters, yarrow, forget-me-not, bear grass, cliff anemones, moss campion, glacier lilies, several sunflowers and buttercups, and all the different vetches and peas, white, yellow, pink, blue, and purple. Such profusion is unusual so late in the season, but even here in the valley it snowed as late as June, and day temperatures didn’t rise above the sixties until July, so in the high country the summer flowers are still, well, flowering their socks off. 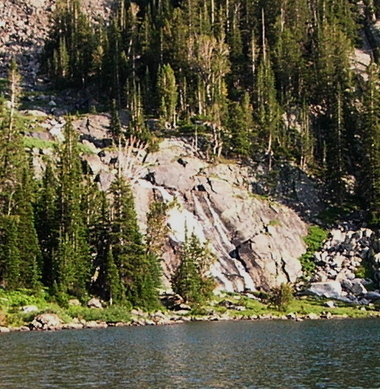 or look forward to the waterfall that plunges from the Pine Creek Lake above to Jewel Lake below. 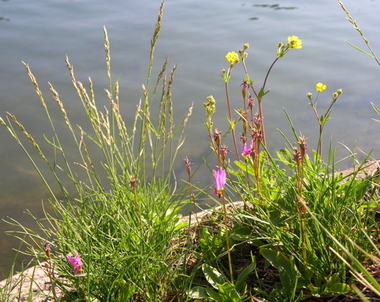 Shooting star and what I think is yellow avens. 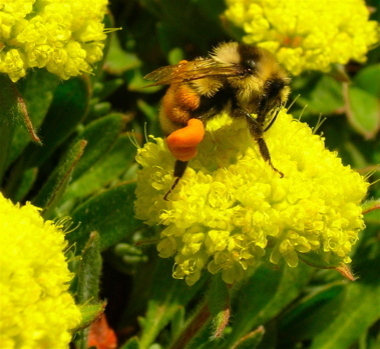 Some of the buckwheat is creamy white, some coral or pinkish, and some, like this, pure yellow. On the way down, there were berries to pick: elderberries by the stream crossing, a huckleberry patch just above it where every bush was laden like the one I included in my post about Lava Lake. There wasn’t time for the currents, thimbleberries, or twinberries. Next time. When we got back Wednesday night, dirty, exhausted, and hungry, husband Steve, who had been holding down the home fort (and his job), cooked us dinner (!) and handed over an article he’d saved detailing a dramatic helicopter rescue from the very mountain our son had climbed a day later. Thursday morning I learned that the woman who’d been injured was my pilates instructor’s business partner and friend. The mountain had not been kind to her; a loose boulder had fallen on her, knocking her from the rock face, and the fall severed her spine. She will be paralyzed below the ribs. I knew her only slightly, but it’s still hard even to write this. The community is mobilizing of course, and I’ll do my bit, but nothing we do will help this woman walk again. It is well to remember that we visit even these local mountains only on sufferance, and that with all their loveliness, they harbor real and imminent danger. Joy turned tragic is so sad. Whoa– I’d taken pilates classes from Liz Ann and Doug had met her at the climbing gym and bicycling events. How horrible. 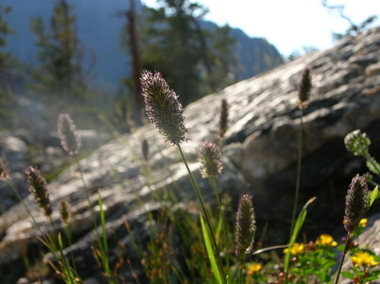 beautiful camping trip by the way– I know what you mean about camera frustrations. Oh how sad. Climbing is such a dangerous sport. 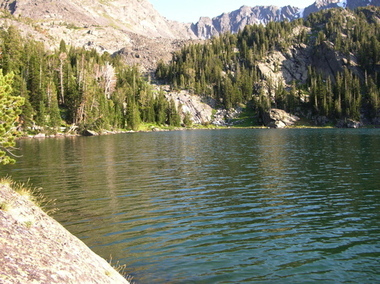 I love backpacking too. Such beauty and peace. Sadly I can’t carry a backpack right now (shoulder issues). I still miss it. Camping just isn’t the same. 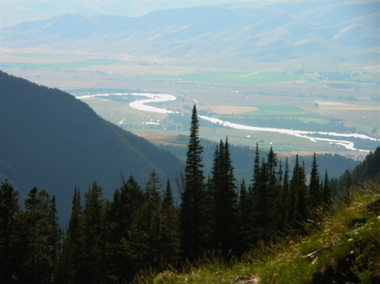 Mother Nature–yes. That’s the thing about Nature. Not always so motherly. Thanks for stopping by; it’s always nice to hear from someone new. Your blog is terrific, by the way! Michãel, I didn’t know you knew Liz Ann but I’m hardly surprised; it seems that everyone I know here in Bozeman either knew her or knew someone who knew her. Small town. Do you have any idea how experienced or skilled she actually was? Doesn’t matter in the end; it’s a terrible, terrible thing. Beautiful photographs you’ve got here!